See you at the W Exhibition? We have an excellent crop of entries this year and would be delighted if you could join us at W-Exhibition to celebrate the best of UK joinery. The awards highlight technical innovation and excellence in joinery projects and joinery product design, process efficiency, health & safety, as well as rewarding the rising stars of the industry. The winners are set to be announced at BWF’s popular Annual Dinner, at Staitioners Hall, Friday 23rd November. We will also be present throughout the show (30th September – 3rd October) on stand R500 where you will be able to drop in and meet members of the team throughout the week. Or at UK Construction Week? 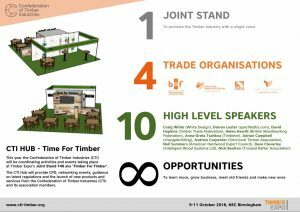 Again this year, the Confederation of Timber Industries (CTI) is returning to NEC Birmingham for Timber Expo (9-11 October 2018). Under the umbrella of the CTI, four major UK trade organisations – British Woodworking Federation, Structural Timber Association, Trussed Rafters Association and the Timber Trade Federation – will be working together to showcase benefits and applications of timber in construction. The CTI Hub (Joint Stand T40) will provide CPD, networking events, guidance on latest regulations and the launch of new products and services from the the CTI and its association members.